You can grow capsicums and chili peppers from seeds in pots and garden beds quite easily if you take proper care of problems in growing. The Capsicum family includes bell peppers or sweet peppers, chillies, cayenne, jalapeño, habañero and Serrano. Peppers come in a variety of shapes, colour, texture and flavours. The shapes of chili peppers include thin and short, thin and long, fat, short and thin, short and wide, bull horn, round, etc. Chillies come in different shapes, sizes colours such as green, yellow, red, orange, purple, etc. Peppers are known by different names depending on place and type. The spicy hot peppers called chili peppers. The mild large peppers are called capsicum in India, Australia and New Zealand; and pepper or bell pepper in North America; and paprika (mainly in powder form) in some countries. 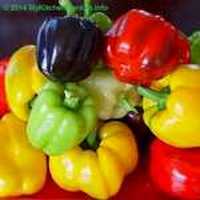 There is a very large bull horn like variety which is known as banana capsicum or bullhorn capsicum in Australia. The chillies contain capsaicin which produces a strong burning sensation (pungency or spiciness) in the mouth. However, bell peppers are without any capsaicin, so they taste sweet. The capsaicin in chili peppers is used in medicines as a stimulant and analgesic and in ointments that soothe sore muscles. The capsaicin is a good protection against cancer. Peppers are relatively easy to grow. The chilli plants are perennials. 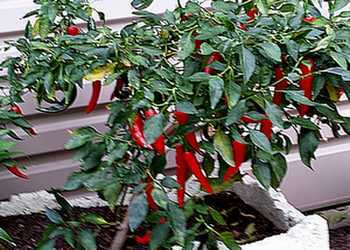 All types of chilli pepper plants are warm season crops and grow well in pots and garden beds. You can grow chillies and capsicums even in your balcony and terrace in pots. The chili plants generally produce more fruits in their second year. Chili plants grow well in a sunny position or if you don't receive a direct sun, then position the plants where they will receive maximum light. The plant grows quickly when the temperatures are higher, and slowly when the temperatures are cooler. You can grow capsicum in pots also. The advantage of growing in containers is that you can move the plant in a sunny position. When it is too hot or too cold, you can move the plant indoors. Chilli peppers need a well drained fertile soil. Add compost, rotten leaf and cow manure in the soil before planting. If you plant 3-4 chilli plants and 5-7 capsicum (bell pepper) plants, it would be enough for a family of 4 to 5. Growing Seedlings: Although you can directly sow seeds, it is better to grow the plants from seedlings (growing seedlings). Make a hole about -5 inch deep and place the seedling in it as deep as it was in the original pot. Fill the hole with soil and water well. Keep a distance of about 30 cm (1 foot) between the two chilli plants. Keep reading on how to take care of your chili, capsicum and pepper plants and get a good harvest of fruits. What is the best fertilizer for pepper plants and when should you fertilize your pepper plants? Fertilize your pepper plants in two stages. First mix the fertilizer into the soil when you prepare the soil for planting the seedlings. As the pepper plants needs less nitrogen, you should feed them with a NPK (5-10-10) fertilizer. 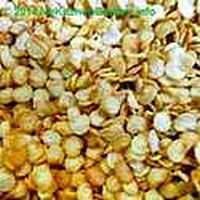 Use about 150 g (0.33 pound) fertilizer for 1 square metre (10 square foot) of garden space. Fertilize again when you see tiny fruits. I feed with a balanced liquid fertilizer every third week. Chillies are self-pollinating, so they are pollinated by shaking of flower stems by hand or wind. They are also be pollinated by bees. 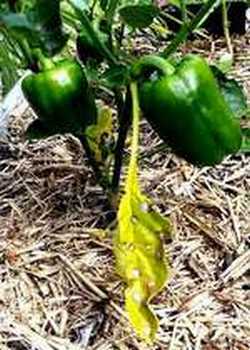 Peppers are comparatively pest and disease free. However, several insects including aphids, the leaf miner, the flea beetle, tomato horn worms (caterpillars) and white flies can attack capsicum pepper plants. They eat the leaves and stems and make holes in leaves of the plants. Many of the insects can be flushed away with a water hose. Peppers can also be infected with fungus, mildew, bacterial spot and tobacco mosaic that causes brown spots and black lesions on the fruit. If you smoke, wash hands before handling plants to avoid mosaic disease. Spread a layer of cow manure and compost and then mulch with peat straw or sugarcane mulch. Most peppers are ready to harvest 60 to 90 days after planting. The more you pick, the more they produce. They can be picked when they become the right size and when they become firm. All peppers, if left on plants will turn into red peppers. Capsicums or bell peppers can be harvested when they get shiny, dark colour but before they lose their firmness. Jalapenos are picked when they are dark green. Chilies make very tasty Chili Pickles and Paneer Harimirchi vegie.